With heavy hearts we had to say goodbye to our beloved Scruff this January. How he and all his goods were “delivered” at our doorstep by Basset Buddies November 2004 and how he was not sure what was expected of him next. He looked so fragile, in that moment he took our hearts. How he overcame his fear of separation after just one week when he knew he found his forever home, how he then decided that making a drive in the car was okay too, no need for pills anymore. How he would listen so well, when he felt inclined to do so. How he loved to go on long walks, as long as he could jump over the snow. In wintertime he was fast: he took care of his business while we were still getting dressed. How he watched over the girls after they were born, how he taught them to walk being their walking aid. How happily he shared his bed with them. How he spent hours “ playing” with them, either being their boyfriend to be married or just being a good listener. Or his favorite: being a pillow and having lots of belly rubs. How he hitchhiked home with the mailman, after being away for hours, following his nose. We worried sick. How he hated our camping trips as he had to be leashed. But he could spend hours just rummaging en sniffing all over the yard. He was some character. 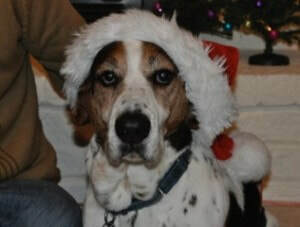 When he got a basset brother George through “ Happy Hounds” in 2007 he loved doing the Basset500 on a daily basis. Afterwards, they loved cuddling up together. How we spent an entire Sunday evening at the emergency room when he and his brother ate through 6 pounds of grapes. Most expensive grapes we ever bought…We could easily fill pages with Scruffy stories. When we were transferred to The Netherlands two years ago, the boys traveled well and loved living here. Though the salty sea took some time to getting used to. His brother George adored him so much that after just one week without Scruff, we unfortunately had to let go of him too. We will miss their happy wagging tails and their singing. How their barks could lift our spirits! The house feels very quite and empty without them. It is some relief to know that Scruffy was already waiting for George on the other side. 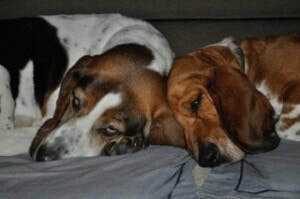 We hope that they will enjoy countless Basset500’s together!! Miss you, Love you guys!